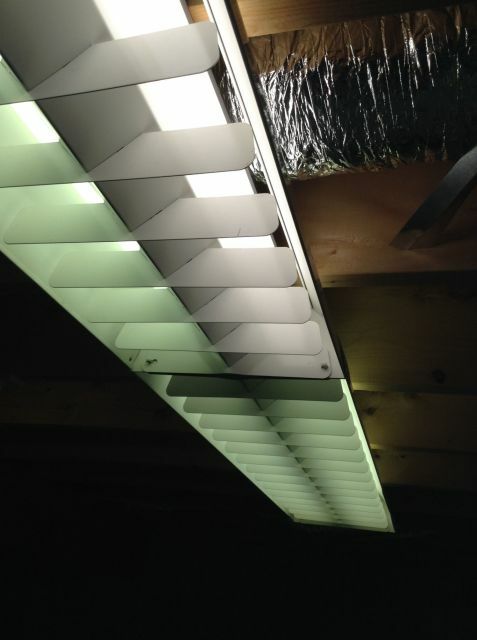 This is an Electrolier (Montreal) louvred fixture that is a companion to my louvred row (which is JA Wilson). The salvage yard had no more complete fixtures by JA Wilson so that is why I have two types. The left lamp of the far most ballast has a near EOL lamp. You can see the dark shadow between the blades at the middle joint. Lamps are 3x34w CW and one 40W Sylvania Cool white deluxe.